Despondence wrote: Nope, not working (or at least, I don't see it). Did you upload it or link it? (I used the linking option). How come your avatar is so big?! Thats not fair.. I seem to recall Thilo saying something about having to disable the avatar function on his Rilke site, because the users found it distracting. Can't imagine why. Hey Steph J, why are there two people in your picture? Which one are you? My avatar is an early image of T.Rex- thats Marc Bolan on the left (he is king) and Mickey Finn, his bongos player, on the right. haha! thankyou, but you must be blind. I'm going to sign up with photobucket later. This is an avatar war! 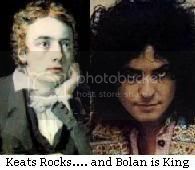 Steph J wrote: :D My avatar is an early image of T.Rex- thats Marc Bolan on the left (he is king) and Mickey Finn, his bongos player, on the right. Um... he crashed into a tree with hsi car. Stephen Saturn wrote: Um... he crashed into a tree with hsi car. Okay, the avatar wars begin - now what can I get now?? ?